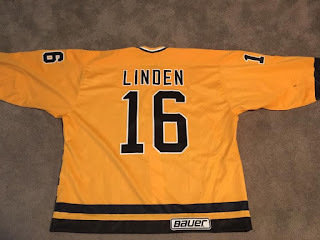 MY HOCKEY CARD OBSESSION: LINDEN WOW OF THE WOW!!! - No Really.......WOW!!! LINDEN WOW OF THE WOW!!! - No Really.......WOW!!! I've been collecting Trevor Linden cards for well over two decades now and I can say with great certainty that it is ABSOLUTELY a passion for me. Why? Well I can still get really excited when I see a special item cross my path, and I can get equally giddy when the item is a top dollar card or a ten-cent piece of cardboard. It's so much more than just the monetary "value" associated with the piece......it's the connection it gives me to the player, the sport and the hobby. This item is one of those that has absolutely knocked my socks off. But first, allow me to set the stage. 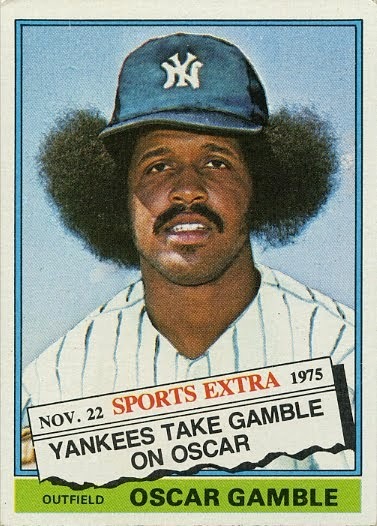 Almost a decade ago, I stated right here on this blog that this card was one of my all-time favourites. You can go ahead and read why in that blog post. Six years ago, I shared a post about a great pic that I had landed with a similar theme to it. And then just four short years ago, I talked about what jerseys would be on my short list (if I had such a list). Well just last week I received an e-mail from a fellow collector that as I mentioned - knocked my socks off. He wanted to see if my signed photo was for sale as he'd like to add it to his little NHLPA pickup. Excuse me while I pick up my jaw from the floor. 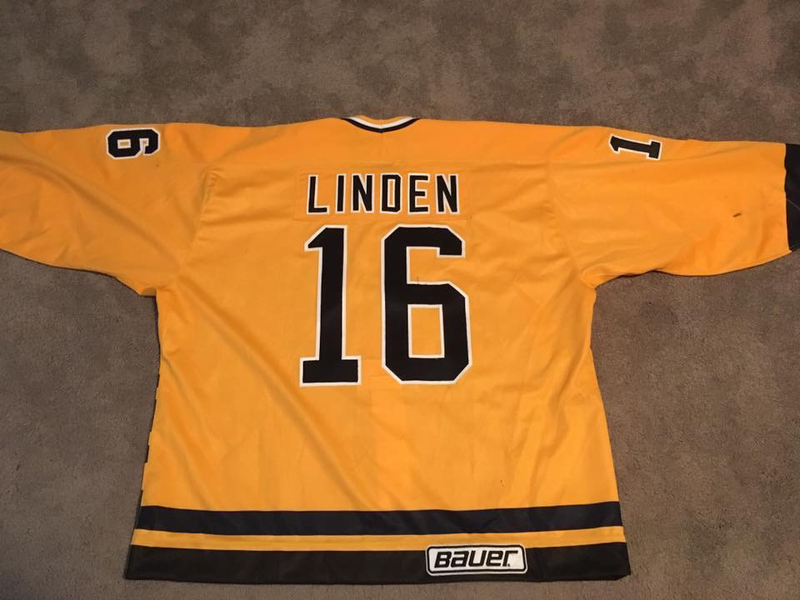 Next to maybe an Olympic jersey, I would think that this would be one of the rarest of Linden game-used items out there. 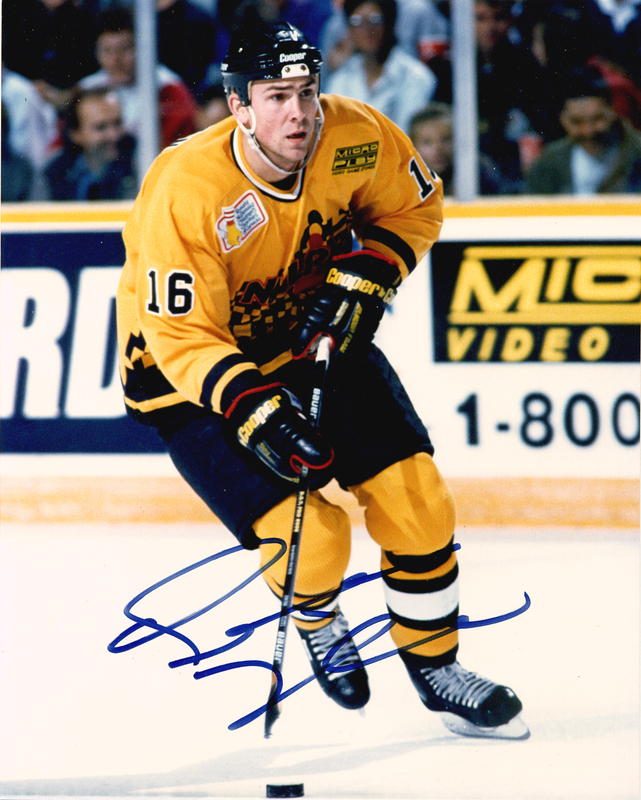 The NHLPA tournament held in the early 90's were (for some reason) a real memorable moment in my Trevor Linden mind's eye. 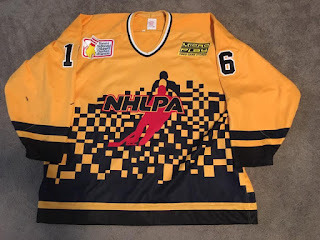 And I really liked the jerseys the guys from the West were wearing. Those yellow sweaters always have me do a double take. It is just as stunning as I knew it would be and I am absolutely thrilled to know the person who is the proud owner of it. 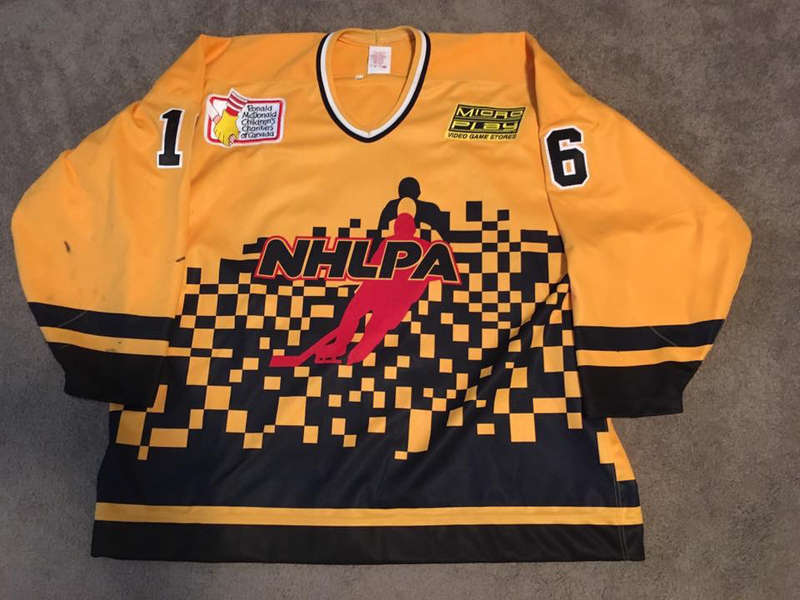 Yeah......say what you want - this jersey is super cool. I just want to keep staring at it. 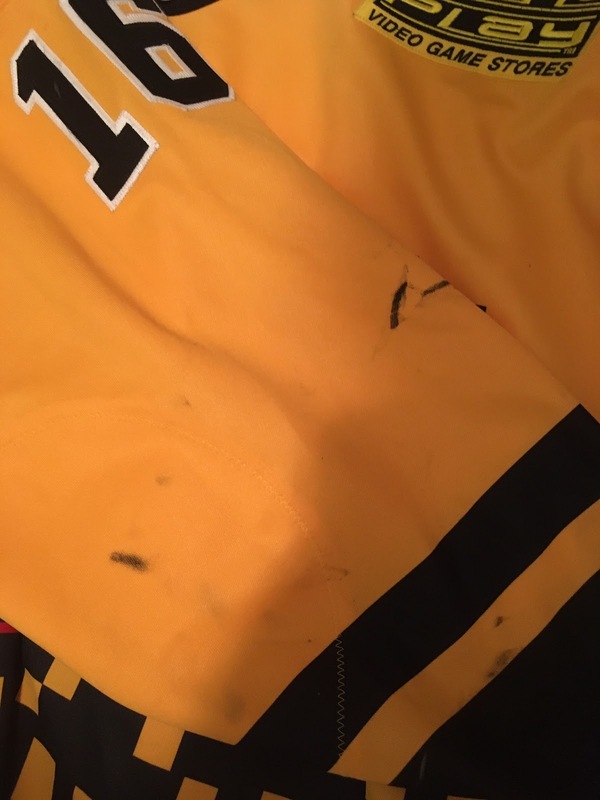 Great puck marks show solid usage of the sweater. 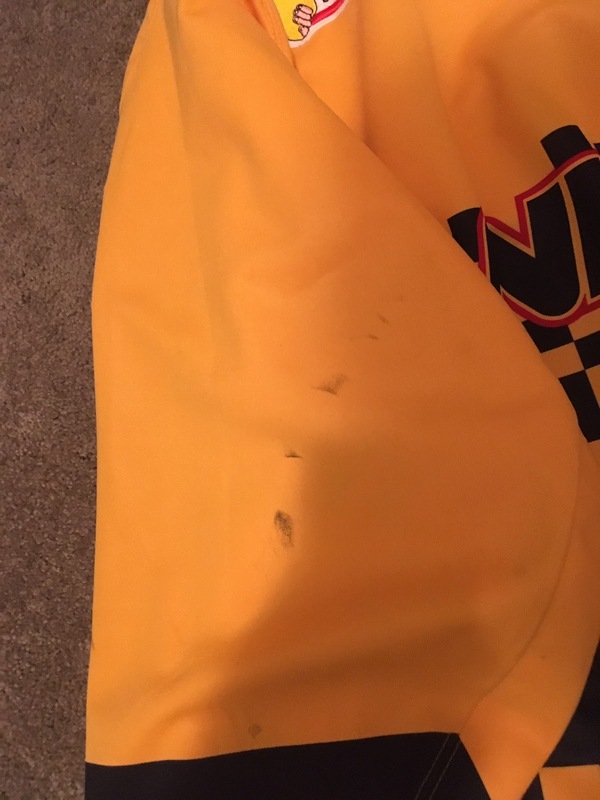 I'm curious if there are any other photos out there that might have some of those marking on it. So now I'm a little bit torn. Do I sell my signed photo? On the one hand, I'm not really a photo guy. On the other hand, it is a pretty rare piece and I've stated on a number of occasions just how much I like it. Without question I'm keeping an eagle eye out for another copy of the pic and in the meantime I'm going to dig the one I have out of the closet again and provide a high resolution scan so at least there's that. Those jerseys do look pretty nice when seeing them up close like this. That signed photo is sweet... but that jersey is a tad bit sweeter! Is there any word more impactful than Wow because I suggest you use it. However, I do have major respect for Wow after all there is the WOW Signal and this is every bit as cool.